Arranged marriage may sound feudalistic, strange, and old-fashioned to most Westerners. In Japan, however, arranged marriage has been playing a significant role in pairing a man and a woman until quite recently. 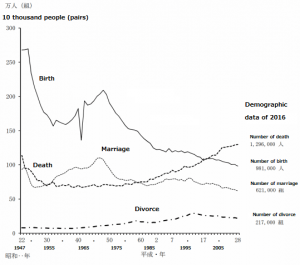 As you can see in Graph 1 (below), the portion of arranged marriage was around 70% before the end of World War II, and it had been more than 50% until 1960. In traditional Japanese society, a marriage was to establish a close relation more between two families than just between a man and a woman. There was no concept of free men and women, and everybody was considered to belong to a family. One of the biggest purposes for traditional Japanese was to let their family continue forever. (You can see the most typical case in the Japanese Emperor family, which is alleged to have continued for more than 2600 years). The most typical arranged marriage is called Omiai, meaning literally to meet a counterpart for the first time arranged by some relatives or acquaintances. 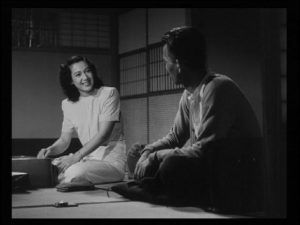 (You can watch examples in some movies of Yasujirō Ozu such as Bakushu (1951), Banshun (1949), or Sanma no aji (1962)). Please note that they were not always “forced marriage”, but the partners to be kept rights whether to accept or decline the proposed marriage. (For the sake of fairness, there were many so called “political marriages” as well and the partners to be did not have any option but to accept the marriage in these cases). Interestingly, most love-marriages were condemned as Yagō, meaning wild pairing, or more literally “intercourses in the field”. (1) People trying to arrange a marriage are considered to take full responsibility for the result of the marriage. It means they were very careful in selecting a possible pair. As a result, they chose well-balanced couples in most cases. (2) Since this system assumes a close relation of two families from the start, there are few troubles after the marriage compared to love-marriage. 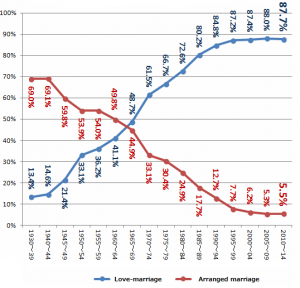 (3) Based on the above (1) and (2), divorce rate is much lower than that of love marriage. 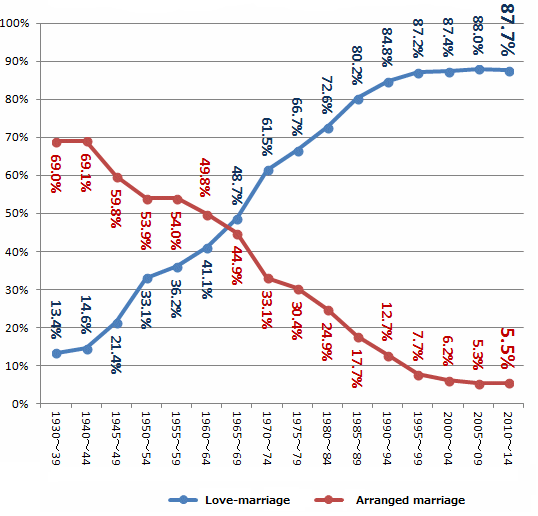 (As you can see Graph 2, the divorce rate in 2016 is more than 30% while the portion of love-marriage reaches almost 90%). (4) Young men and women at certain ages are forced to marry someone in this system. This kept the average marriage age at almost the same level. (Delayed marriage is quite a big problem in Japan now, because it lowers the birth rate and accordingly the total population in Japan has started to decline). As a conclusion, arranged marriage can be said to be an example of “hidden wisdom” in a traditional system.